And then I punched her. Okay, maybe I didn’t, but I sure wanted to. The good news is that my skin has drastically improved since high school. The bad news is that I recent started experience breakouts again. So I reached back into the files in my brain and sifted through all of the things I learned when I was in my late teens/early twenties, and after a couple of weeks, I’m no longer embarrassed to leave the house. Here are my best tips for a clearer complexion that actually work! Because no one should ever look as bad as I did in the early 90s, you know? My dermatologist told me about the link between sleep and acne when I was a senior in high school, but I always assumed my mother had slipped him 50 bucks to tell me that so I’d stop gabbing on the phone with Douche Rocket (a.k.a. my high school ‘sweetheart’) until the wee hours of the morning. So I ignored the advice and didn’t think about it again until I started to break out a few weeks ago. And guess what? My recent skin problems didn’t start until I was in the throes of a huge work project and averaging less than 5 hours of sleep a night. And since I’ve been continuing on that trend for weeks on end, it’s no wonder I look like a hormonal teenager. Have you recently started using a new foundation or brand of blush? What about your facial wash? Is it new? How about your hair? Are you spraying copious amounts of hair spray on it? All of these things can contribute to a sudden increase in blemishes, so be weary when you try new products, and only introduce one new item at a time so you can pinpoint if anything in particular is giving you problems. The last time I had a bad breakout was about 2 months before our wedding when I was juggling florists, caterers, photographers, and wedding dress fittings while also holding down a full-time job. I remember feeling intense fear that I would look like a monster when the big day finally arrived, so I headed on over to our local pharmacy on my lunch break one day, and the gal in the beauty section took one look at my skin and said, “you don’t moisturize, do you?” I was shocked that she thought I should be adding lotion to my disgusting skin, but I have been using La Roche-Posay Effaclar Duo Dual Action Acne Treatment Cream on my face ever since and I absolutely swear by it. I hate to break it to you, but anything that tastes good (think: refined carbs, fried foods, and chocolate) can cause you to break out. Don’t believe me? Then read Can Food Cause Acne? by YouBeauty.com and you’ll see why you need to throw the Ho Hos away and start snacking on celery sticks. Pronto. 5. KEEP YOUR HANDS TO YOURSELF! When I was considering buying the Proactiv 3 Step Acne Treatment System right before my wedding, the gal that was working at the kiosk at the mall taught me this trick. She had flawless skin, and when I asked what her secret was, she told me that she washed her face with regular soap and water, never applied any medicated creams to her skin, and never, ever, touched her face. And she emphasized the word “ever”. So before I took out a second mortgage to buy acne products that would dye all of our towels and bedding, I gave her trick a try, and I’ll be darned if it didn’t work! And let’s face it – with cold and flu season not quite over, you really shouldn’t be touching your face anyway. It’s no secret that water is the answer to all of our problems. It helps us lose weight. It boosts our energy. It makes us more regular. It flushes toxins out of our bodies. And it makes our skin look better. I used to think sunbathing was the solution to bad skin because the moment I spent any time in the sun, my skin always cleared up. But then a couple of days would go by, and the excess grease the sun exposure caused inevitably made my skin WORSE. I’ve since become an expert at sunless tanning and my skin is MUCH happier as a result. I don’t know about you, but I sweat like a man when I go to the gym, and if I go long stretches between workouts, I start to notice an increase in blemishes along my hairline and on my back. So I try not to slack on my gym routine, and I’m always careful to soap myself up as soon as I get home from a workout. Well, sometimes I shove a few handfuls of Cinnamon Toast Crunch in my mouth first, but that only takes a couple of minutes. Now, I’m sure there are a lot of other tips for a clearer complexion (like cutting out booze – gasp! ), but these seem to be the key things that keep me from looking like a pubescent teen. I just need a kick in the pants to get back on track, you know? 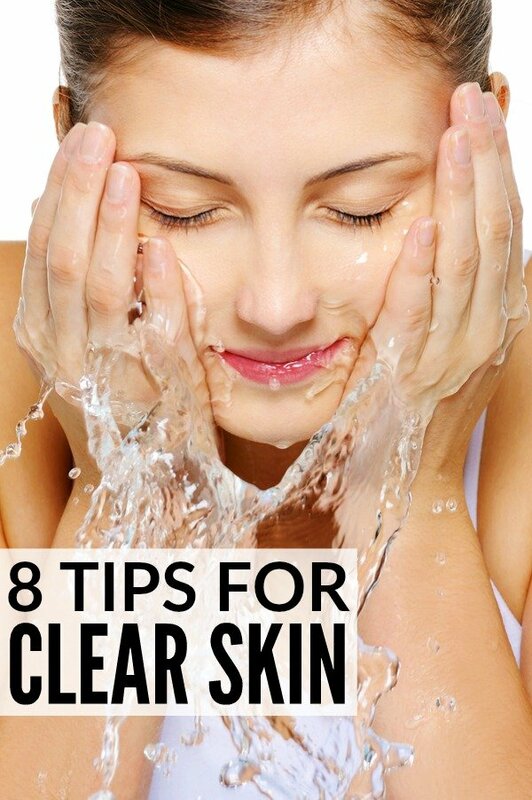 If you found these tips for a clearer complexion helpful, please share them on Pinterest! And if you’re looking for more beauty tips and tricks, please follow our Beauty board!